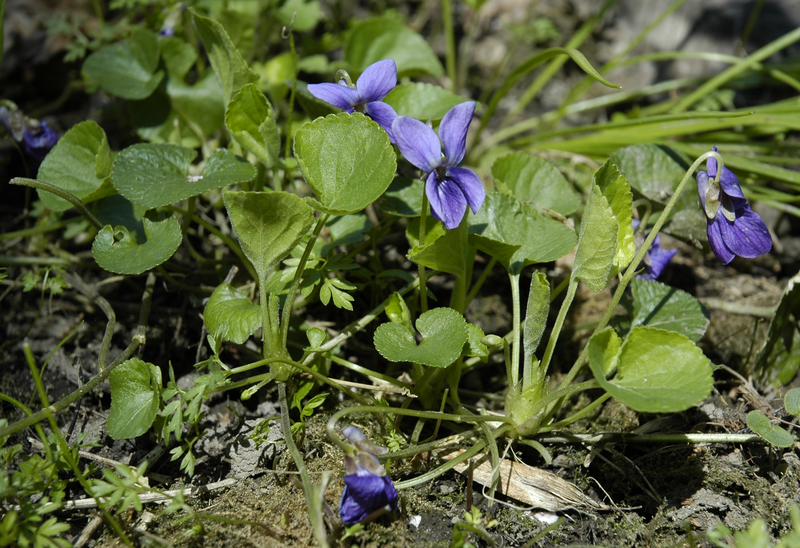 Sweet violet Viola odorata, photographed by Kjetil Lenes. The Violaceae are a family of flowering plants including the violets (Viola) and related species. Though Viola contains the majority of species and is herbaceous, species in other genera of Violaceae are shrubs. See also: Taxon of this Week: not all violets are violet. Characters (from Watson & Dallwitz): Herbs, or shrubs, or lianas, or rarely arborescent. The herbs with a basal aggregation of leaves, or with neither basal nor terminal aggregations of leaves. Self supporting, or climbing. Mesophytic, or helophytic. Leaves alternate (usually), or opposite; spiral; petiolate, or petiolate and subsessile, or subsessile; non-sheathing; not gland-dotted; simple; epulvinate. Lamina entire (usually), or dissected; when dissected, pinnatifid; pinnately veined, or palmately veined; cross-venulate. Leaves stipulate. Stipules free of one another. Leaves without a persistent basal meristem. Leaf anatomy: Mucilaginous epidermis often present. Stomata present; anisocytic, or paracytic. Adaxial hypodermis present, or absent. Lamina dorsiventral (usually), or centric. Stem anatomy: Nodes tri-lacunar. Primary vascular tissue in a cylinder, without separate bundles, or comprising a ring of bundles. Secondary thickening developing from a conventional cambial ring. Xylem with libriform fibres, or without libriform fibres; with vessels. Vessel end-walls scalariform, or simple, or scalariform and simple. Wood parenchyma sparse paratracheal (or absent). Fertile flowers hermaphrodite. Plants hermaphrodite (sometimes cleistogamous). Pollination entomophilous. Flowers solitary (axillary), or aggregated in ‘inflorescences’; when solitary, axillary; when aggregated, in cymes, or in racemes, or in heads, or in panicles. Ultimate inflorescence unit cymose. Inflorescences usually racemes, panicles or heads. Flowers (bi-) bracteolate; fragrant, or odourless; somewhat irregular to very irregular (usually), or regular. The floral irregularity involving the perianth, or involving the perianth and involving the androecium. Flowers pentamerous; cyclic; tetracyclic. Free hypanthium absent. Perianth with distinct calyx and corolla; 10; 2 whorled; isomerous. Calyx 5; 1 whorled; polysepalous (usually, more or less), or gamosepalous (at the base). Calyx lobes markedly longer than the tube. Calyx unequal but not bilabiate, or regular; basally appendaged, or neither appendaged nor spurred; persistent (often); imbricate, or open in bud; with the median member posterior. Corolla 5; 1 whorled; polypetalous; imbricate (usually, with descending aestivation), or contorted; unequal but not bilabiate (usually), or regular; spurred (the enlarged anterior member, often), or not spurred. Petals clawed, or sessile. Androecium 5. Androecial members free of the perianth; free of one another, or coherent; often 1 adelphous (forming a cylinder round the ovary); 1 whorled. Androecium exclusively of fertile stamens. Stamens 5; isomerous with the perianth; oppositisepalous; alternating with the corolla members. Anthers cohering (often), or connivent, or separate from one another; adnate; introrse; tetrasporangiate; appendaged (the two anterior members often appendaged or spurred, the connective often prolonged), or unappendaged. Endothecium developing fibrous thickenings. Anther epidermis persistent. Microsporogenesis simultaneous. The initial microspore tetrads tetrahedral, or isobilateral, or decussate. Anther wall initially with more than one middle layer (2 to 4). Tapetum glandular. Pollen grains aperturate; 3(–5) aperturate; colporate. Gynoecium (2–)3(–5) carpelled. Carpels reduced in number relative to the perianth (usually), or isomerous with the perianth. The pistil 1 celled. Gynoecium syncarpous; eu-syncarpous; superior. Ovary unilocular; 1 locular. The ‘odd’ carpel anterior. Gynoecium stylate, or non-stylate (Melicytus). Styles 1 (of various forms). Stigmas 1, or 3–5 (Melicytus); truncate (or appendiculate); dry type; papillate; Group III type. Placentation parietal. Ovules in the single cavity 1–100 (to ‘many’); arillate; anatropous; bitegmic; crassinucellate. Outer integument contributing to the micropyle, or not contributing to the micropyle. Embryo-sac development Polygonum-type. Polar nuclei fusing only after one has been fertilized, or fusing simultaneously with the male gamete (?). Antipodal cells formed; 3; not proliferating; ephemeral (usually), or persistent (Hybanthus concolor). Synergids often hooked (but only rarely with filiform apparatus). Endosperm formation nuclear. Embryogeny asterad. Fruit fleshy, or non-fleshy; dehiscent, or indehiscent; a capsule, or a berry, or a nut (rarely). Capsules loculicidal and valvular. Fruit when capsular, elastically dehiscent. Seeds endospermic. Endosperm oily. Seeds winged, or wingless. Cotyledons 2 (flat); flat. Embryo straight. Germination phanerocotylar. Not cyanogenic. Alkaloids present, or absent. Iridoids not detected. Proanthocyanidins absent. Flavonols present; kaempferol, or kaempferol and quercetin. Ellagic acid absent (4 genera, 4 species). Saponins/sapogenins present, or absent. Aluminium accumulation demonstrated. [Al27] Allan, H. H. 1927. The vegetation of Mount Peel, Canterbury, New Zealand. Part 2. – The grassland and other herbaceous communities. Transactions and Proceedings of the New Zealand Institute 57: 73-89. [An27] Andersen, J. C. 1927. Popular names of New Zealand plants. Transactions and Proceedings of the New Zealand Institute 57: 905-977. [BS01] Bannister, P., & G. L. Strong. 2001. The distribution and population structure of the temperate mistletoe Ileostylus micranthus in the Northern Cemetery, Dunedin, New Zealand. New Zealand Journal of Botany 39: 225-233. [CA27] Cockayne, L., & H. H. Allan. 1927. Notes on New Zealand floristic botany, including descriptions of new species, &c. (No. 5). Transactions and Proceedings of the New Zealand Institute 57: 48-72. [C45] Colenso, W. 1845. Memoranda of an excursion, made in the Northern Island of New Zealand, in the summer of 1841-2; intended as a contribution towards the natural productions of the New Zealand groupe: with particular reference to their botany (concluded). Tasmanian Journal of Natural Science 2: 241-308. [DL07] Davis, C. C., M. Latvis, D. L. Nickrent, K. J. Wurdack & D. A. Baum. 2007. Floral gigantism in Rafflesiaceae. Science 315: 1812. [GR98] Greuter, W., & T. Raus (eds.) 1998. Med-Checklist Notulae, 17. Willdenowia 28: 163-174. [KC83] Körner, C., & P. Cochrane. 1983. Influence of plant physiognomy on leaf temperature on clear midsummer days in the Snowy Mountains, south-eastern Australia. Acta Œcologica Œcologiae Plantae 4 (2): 117-124. [MM04] Martin, N. A., & L. A. Mound. 2004. Host plants for some New Zealand thrips (Thysanoptera: Terebrantia). New Zealand Entomologist 27: 119-123. [MH98] Morikawa, H., A. Higaki, M. Nohno, M. Takahashi, M. Kamada, M. Nakata, G. Toyohara, Y. Okamura, K. Matsui, S. Kitani, K. Fujita, K. Irifune & N. Goshima. 1998. More than a 600-fold variation in nitrogen dioxide assimilation among 217 plant taxa. Plant, Cell and Environment 21: 180-190. [NC01] Nekola, J. C., & B. F. Coles. 2001. Systematics and ecology of Gastrocopta (Gastrocopta) rogersensis (Gastropoda: Pupillidae), a new species of land snail from the Midwest of the United States of America. Nautilus 115 (3): 105-114. [PAE98] Pakeman, R. J., J. P. Attwood & J. Engelen. 1998. Sources of plants colonizing experimentally disturbed patches in an acidic grassland, in eastern England. Journal of Ecology 86: 1032-1041. [PT01] Pemberton, L. M. S., S.-L. Tsai, P. H. Lovell & P. J. Harris. 2001. Epidermal patterning in seedling roots of eudicotyledons. Annals of Botany 87: 649-654. [PB03] Poinar, G. O., Jr., & A. E. Brown. 2003. A non-gilled hymenomycete in Cretaceous amber. Mycological Research 107 (6): 763-768. [W91] Williams, P. A. 1991. Subalpine and alpine vegetation of granite ranges in western Nelson, New Zealand. New Zealand Journal of Botany 29: 317-330. Are Hawaiian Isodendrion outside of violaceae? It appears that Isodendrion is a member of the Violaceae. The listing in this post isn't (as yet) complete, not by a long margin.